Overview - You're not hallucinating (but they are)… It's the legendary toker jokers Cheech & Chong as you've never seen them before -- in their very first Animated Movie. Catch the buzz as their most outrageous routines and laugh-out-loud lines from their Grammy Award-winning albums come to life, including "Dave's not here," "Let's make a dope deal" and more. With help from a bud-lovin' body crab named Buster, Cheech & Chong "the masters of smokin' word" deliver the ultimate comedy high and give you the munchies for more. It's often said that some things are only funny when you're high. Though I haven't personally tested it, I have to assume that sentiment holds true for 'Cheech & Chong's Animated Movie.' In fact, I can imagine the flick being pretty damn hilarious while totally baked. Sober, however? Well, that's a different story. A very different story. Really nothing more than a crudely animated hodgepodge of some of the duo's classic album recordings, this is all just old material -- some of which hasn't aged particularly well. Even worse, the bits that do still work are more often than not actually hampered by the new animation rather than enhanced by it. And that's not cool, man. Not cool at all. Featuring a fairly random assemblage of previously recorded sketches from the infamous stoner pair, the runtime follows various skits fueled by marijuana related humor. All of the audio has been animated after the fact in a similar fashion to something like 'The Ricky Gervais Show,' providing visuals to the once audio only elements. Some of the classic bits provided include "Let's Make a Dope Deal," "Up his Nose," "Sister Mary Elephant," and perennial fan favorite "Dave's Not Here." Very loosely stringing these unrelated sequences together, is a running gag involving a body crab named Buster who desperately wants to set up shop in Chong's beard. Despite how comically inspired that above summary surely sounds, the results are sadly lacking. The filmmakers' attempts to connect the sketches are so thin and poorly conceived that I'm a little confused as to why they bothered at all. As it stands, the movie basically plays out like a disconnected series of episodes anyway, and the forced narrative throughline with Buster ends up being more distracting than amusing or functional. Unfortunately, even ignoring this miscalculated effort, the individual skits themselves are extremely uneven, and many of them really haven't stood the test of time. The raunchy, irreverent pot humor gets old really fast, and a lot the material lacks substantial wit. Unfortunately, the animation itself is also a little problematic with a very simple and crude style. Character designs are effective but mostly generic, and backgrounds are very sparse. The visual embellishments rarely add much to the humor, and the newly animated jokes are mostly relegated to vulgar sight gags involving excrement, urine, erections, and farts, or painfully exaggerated stereotypes (like a pair of enormous noses on two Jewish characters). At their worst, these additions actually end up diminishing a lot of the legitimate comedy found in the duo's vocal performances, drawing attention away from the silly nuances in their deliver. If anything, the movie only proves how much more effective these sketches are when the audience is only focused on the audio, letting their own imaginations fill in the blanks themselves. Though I'm admittedly not a big fan of Cheech and Chong to begin with, I have seen and enjoyed a few of their live action flicks, and I've heard some of these sketches before on their comedy albums -- and found them to be a hell of a lot more entertaining that way. Huge fans of the comedians might want to check this out to see the animated interpretations of their favorite skits, but honestly, your imagination is probably a lot funnier than what the filmmakers have come up with here. This is actually one of those very rare movies that's somehow more enjoyable if you close your eyes -- or better yet, if you happen to be under the influence of some "badass weed." Not that I would know anything about that. Seriously, that movie score would be very different if I did. 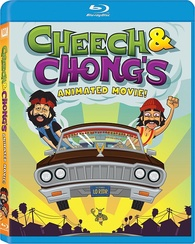 20th Century Fox brings 'Cheech & Chong's Animated Movie' to Blu-ray on a BD-25 disc housed in a keepcase. Some skippable trailers play upon start up before transitioning to a standard menu. The release is region A coded. The movie is provided with a 1080p/AVC MPEG-4 transfer in the 1.85:1 aspect ratio. While the animation style is extremely simple and basic, the transfer offers a crisp and colorful image that's only held back slightly by some occasional artifacts. Very minor aliasing is apparent around the edges of some objects and characters, and banding is periodically visible, particularly in background walls and skies. The crude animation doesn't lend itself to much fine detail, but the modest style is rendered with sharp clarity. Colors are vibrant, offering bright primaries and solid pop. Contrast is nicely balanced and black levels are deep and consistent, but the overall picture retains a flat appearance. There isn't a whole lot to the video presentation here, but the colors are bright and punchy, and despite some periodic banding, the animation looks nice for what it is. The film is presented with an English DTS-HD Master Audio 5.1 track, and Spanish and French Dolby Digital 5.1 tracks. Optional English SDH, French, and Spanish subtitles are also included. Effects work perks up every now and then, and the music is spread out well, but by and large this is a dialogue driven mix with little sense of immersion. The track starts off with a punchy, robust intro, but peters out shortly after. Thankfully, dialogue remains clear and full throughout, though there is some isolated peaking (particularly when Sister Mary Elephant screams). The thumping music (including several new tracks from the stoner duo) is spread nicely around the room, but outside of a few fleeting effects (an ambulance siren driving by, for instance) the sound design is very frontloaded, staying true to the original recordings' modest roots. With that said, when there are modern embellishments, the sound effects and score can start to overpower the track, leading to some minor balance issues. Outside of the aforementioned peaking, dynamic range is wide and clean, particularly during a musical performance near the end which offers deep low frequencies. While it's hard to fault the track for staying faithful to the sketches' origins, the additional/re-mixed effects and music can be uneven, lacking consistency, finesse and balance. 20th Century Fox has put together a decent collection of supplements, including three commentaries and a short, live action sketch/musical performance. All of the special features are presented in 1080p with Dolby Digital 2.0 audio and no subtitles. Joint Commentary by Cheech Marin & Tommy Chong - The duo offer a solid track that's expectantly laid back. While details on the actual movie are slim, the pair provides some decent insights into how they came up with the original sketches and characters, and share many anecdotes about their heyday performing in the 70s. It's not a real must listen, but fans of the comedians will probably enjoy hearing the pair of old friends reminisce together. Commentary by Chambers Brothers and Lou Adler - Much more geared toward the actual production and animation process, here the directors and producer describe how the project came to be, how they went about creating a narrative throughline, and elaborate on their choices to open up the skits with different (often crude) visual gags. The filmmakers also share some of the amusing notes that Cheech and Chong gave them about their work. Commentary by Tommy Chong & Paris Chong - In this track, Tommy Chong is joined by his son who also served as a co-producer on the film. Chong mostly spends time reminiscing more about the original sketches while answering questions from his son and though there is some repetition from the previous two tracks, there are also several new stories shared as well. 4.20 Listening Mode - This playfully titled feature, simply lets one listen to all three commentary tracks back to back. "Medical Marijuana Blues" Session w/Blind Melon Chitlin' (HD, 5 min) - This is a recent sketch with Cheech and Chong recording a new song for the film. In the bit, Chong plays a blind musician and Cheech has to literally read him the lyrics as he records the track. It's not exactly comedy gold, but it's fairly amusing. Cheech & Chong Slideshow (HD, 3 min) - Here we get a brief slideshow of images from the film compared to photos of the comedians performing and recording the same sketches live. 'Cheech and Chong's Animated Movie' is a disappointing anthology of the stoner duo's past sketches. The simple animation not only adds little to the humor, but in many cases, actually takes away from the vocal performances that made the original skits funny to begin with. The video transfer offers a crisp image with bright colors, but some minor artifacting is visible. The audio mix respects the modest limitations of the original recordings, but some of the new effects and music can be a little overpowering. While the included commentaries are a welcome addition, I doubt many will find the need to listen to all three tracks. With its mediocre animation, this disc will only appeal to big fans.